The Central Government has given a little relief to the co-op housing societies that have an annual income of over Rs 20 lakhs or those that have been collecting monthly maintenance charges of more than Rs 5,000 by relaxing the norms of GST. The co-op housing societies, having an annual income of over Rs 20 lakh or those collecting monthly charges of more than Rs. 5,000, are required to pay 18 per cent GST on their income from July 1, 2017 onwards, but now effective January 2, 2018, the societies have been collecting monthly charges up to Rs. 7,500 from their members who have been exempted from paying 18 per cent GST. In other words, the GST will be applicable only to those societies collecting monthly charges of more than Rs. 7,500. 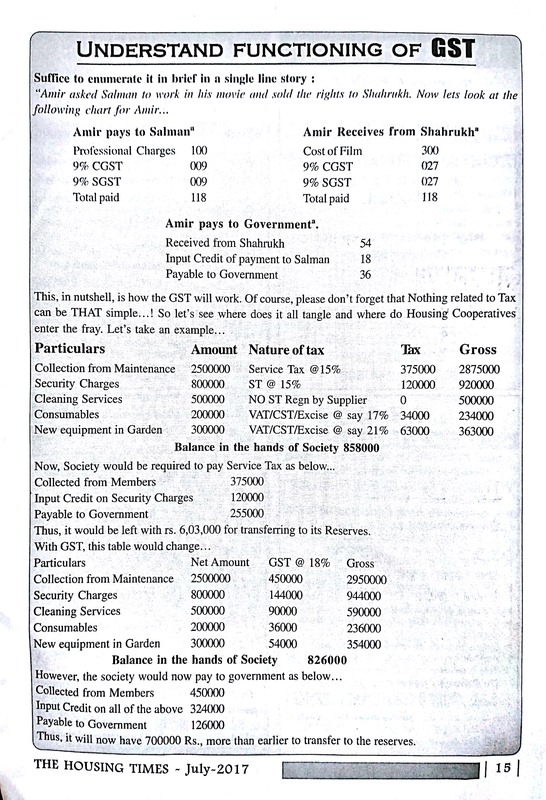 The societies’ income includes the money earned while transferring flats in the name of new owner in case of resale of flats, repairs and maintenance charges, parking charges, sinking fund, non-occupancy charges, or simple interest for late payment of dues, which attracts GST, since these charges are collected for supply of services meant for members. In many instances, transfer fees, that are charged by the societies and paid by incoming and outgoing members when a flat in the society is sold, contribute significantly towards a society’s annual collection. While the model bylaws under the Maharashtra Co-operative Societies Act have placed a limit of Rs 25,000 on transfer fees, in reality the fees run into a lakh or more per transfer. Thus, collections from transfer fees may mean that even societies housing the middle classes also find themselves having a turnover of over the threshold of Rs 20 lakh. Maintenance charges are collected by co-op housing societies for purposes like providing security, lift upkeep, maintenance of common areas and are typically a reimbursement for expenses incurred. If total collections of the societies are less than Rs 20 lakh a year, then they are not required to be registered under GST. Consequently, they are not liable to impose GST on taxable services. Smaller societies with lower annual collection (revenue) are out of the GST ambit. However, in luxury societies having facilities like a club house, gym or swimming pool, monthly maintenance charges are steep, running up to over a lakh. The annual collection of such societies are typically far higher than the Rs 20 lakh threshold. So, GST is levied by such societies. There are over 90,000 registered cooperative housing societies in Maharashtra, out of which nearly 50,000 cooperative housing societies are in Mumbai, Navi Mumbai, Thane and Mumbai Metropolitan areas alone. Roughly there are 29,000 societies in Mumbai, 6,000 societies in Thane and 5,500 societies in Navi Mumbai and over 2,800 societies in MMR including Panvel. Some of the societies located in Malabar Hill, Napean Sea Road, Pedder Road in South Mumbai and some of the housing complexes located in suburbs, have a limited member strength, but their maintenance charges per flat are heavy. Speaking to The Afternoon D&C, Mahendra Mhaske DD-III said that it is mandatory for all such societies to register themselves under GST. Maharashtra Societies Welfare Association (MSWA ) Chairman, Ramesh Prabhu said that earlier the societies were required to pay different type of taxes. But now under this system, the tax structure is expected to be rationalised. Services provided by government or local authorities to persons other than business entities are exempted from GST. Thus, if property tax or water tax is collected by the CHS on behalf of the BMC from individual flat owners, then GST is not chargeable. Similarly, GST is not chargeable on non-agricultural tax or electricity charges collected under other statutes from individual owners. The Maharashtra government in a trade circular has asked all those who have received the 15-digit Goods and Services Taxpayer Identification Number (GSTIN) to display the number on the board and certificate of registration at a prominent location at the business premises. Failing to which, the state government says, the person will be liable for penalty of up to Rs25,000. Rule 18 of the Maharashtra Goods and Service Tax (MSGT) Rules, 2017 mandates display of GSTIN on the name board. •Every registered person shall display his certificate of registration in a prominent location at his principal place of business and that every additional place or places of business. Additionally, as per the circular, there is a penalty of Rs10,000 on issuance of incorrect tax invoice. Rule 5(1)(f) of the MGST Rules says that every registered person exercising the option to pay tax under section 10 of the MGST Act i.e. every registered person opting under the composition scheme shall mention the words ‘Composition taxable person not eligible to collect tax on supplies’ at the top of the bill of supply issued by him. Under Rule 46(b) of the MGST Rules, the person is expected to issue an invoice in unique and consecutive serial number. “However, many a times, it is seen that the invoices are not numbered in a serial manner but are randomly numbered or not numbered at all. It is to be noted that the same is against the provision of the Act and not following the provisions will attract penalty under section 122(1)(i) of the MGST Act, 2017. It is also to be noted that any deviation from the provisions will be taken seriously,” the trade circular says. Under Section 122 (1)(i), the penalty is Rs10,000. As we know that 18% GST is made applicable on the maintenance payment made by very own members of the cooperative housing society to the same co-operative housing society managed by the same members themselves. I feel that this decision of the Government is not in line with the basic concept and principles of co-operative housing societies in India. 1. The Co-Operative Housing / Residential societies in India are maintained by the very own members of these co-operative societies. These members of the societies come forward voluntarily to serve themselves through their own services to their own flats / houses in the society. These members are neither paid any salary nor monitory benefits for their services provided by them to themselves in the co-operative societies. Meaning, members are providing their own services to themselves. So, if I am providing the service to me and that service is also consumed by me only, then why should I pay the GST tax on it to the Government for the same? 2. The concept of co-operative for the housing societies is to manage the society by its members themselves, meaning there are no two distinct bodies i.e. Separate giver of services and separate receiver of the services do not exist in co-operative housing societies. It’s a one body like left leg supporting right leg and vice-versa to lift the entire load of the one body. Where is the concept of delivery of services within one body fit into this mechanism? 3. Why the maintenance of the houses / flats in the co-operative societies is considered as a Business? Any logic behind it? 4. We, as a resident members of the co-operative Housing society are already paying the Property Taxes on our house / flat to the Municipal Corporations, which is almost in the range of 20% to 100% of our annual maintenance. Then why are these property taxes levied on the flats if GST is also levied? Then withdraw property tax on flats. 5. Co-operative societies being the end point of consumption of the material or services from the outside vendors, the materials and the services used by the co-operative societies from the outside agencies / vendors are already charged with GST and are paid by the co-operative societies and these vendors in tern pay these taxes to the Government. The final amount with GST is charged to the maintenance of the members flat within the society for such services obtained from outside. Where is the question of charging of GST to members’ come into this picture? Do the government expect us again to charge GST of 18% on the same services to the members?? 6. When the members purchase the house / flat in the co-operative society, then they already pay or paid the following taxes/ duties to the State Government on the Agreement Purchase value of the flat/house in Pre-GST era. The above taxes are almost amounting 12% of the Agreement Value. Means, State and Central Government has already earned their taxes through the purchase of the house. The same is applicable for the purchase of the house after GST and the total taxes would be increased to huge amount of 18% GST on the Agreement / Purchase Value. We, as an individual members are paying 18% GST for the purchase of the house and we cannot claim any refund of the same. Meaning, the State and Central Government has already earned their taxes, then why do Government want to put the GST (18%) on the maintenance of these property? What is the Government Role in maintaining these properties which are fully maintained and by the members themselves? Is government giving any insurance to these co-operative societies in return? 7. GST is being charged on the Sinking Fund and Repair fund as well, it means more and more we save in the sinking fund for our own security of the house to re-build it in future in case of any calamities or in case of fire or in case of earthquake, we need to pay more and more taxes to government. Is government taking the responsibilities of the re-building of our houses / flats in the co-operative societies in case they are damaged, gutted in fire, or in earthquake or need to re-develop in future due to lack of original construction quality through the GST paid on these amounts?? 8. Moreover, most of the members of these co-operative societies are the tax payers i.e. they file their own returns on their taxable income every year. The net amount leftover after paying the direct tax on the income is used to take care of household expenses one of which is the payment of the maintenance of the house/flat in the society. Is government giving refund claims to the members for the GST paid on the house maintenance into their direct taxes?? 9. Why is the limit of GST applicability fixed to the maintenance amount of Rs.5000/- and above. What is the logic behind it? 10. Why the limit of collection below 20 lacs per annum is fixed for this? Is maintaining the Co-operative societies considered as a Business?? We are not running the business of maintaining the houses / flats, we are maintaining the houses / flats on our own to live in the better condition same as we maintain our body to live in the good health condition with the co-operations of our own body parts. Why is the business approach forced on the working or maintaining of the co-operative societies by putting the collection limits of 20 lacs? 11. By applying GST on co-operative societies, is government just trying to make more money through the hard earned money of the citizens maintaining their own houses by their own in cooperative housing societies? To my notice, the government has not considered most of the points listed above before applying the GST on maintenance payment made by members to co-operative housing societies managed by themselves. There is no valid logic to apply GST on maintenance payment by the members to the cooperative housing society. Hence, I request and appeal to Honorable Supreme Court of India through this PUBLIC INTEREST LITIGATION (PIL) to consider to WITHDRAW the GST applied on the maintenance payment made by the very own members of the cooperative society to the same co-operative society managed by the members of the same cooperative housing society themselves. I request to provide the stay on the applicability of GST on the Maintenance Payment of the Cooperative Housing societies till the final verdict from Supreme Court of India is given on this PIL. Government of India is pushing for Implementation of GST on the 1″ of July 2017. In the latest GST Council .meeting held on the 3rd of June 2017, all the States have also agreed to the implementation date as it of July 2017. Since GST deals with all sorts of goods and . services, manufacture, import, export, trade, etc. while addressing the requirements of the specific sector of Housing Societies , many practical issues arise and are not addressed properly. This article is an attempt to understand these constraints. 1. Registration : Every Society with an aggregate turnover of over Rs 20 lakhs is required to be registered under GST. The aggregate turnover includes all maintenance charges (Other- than Municipal Tax), any miscellaneous income, and includes Bank interests. Further, every society engaging an advocate or an advocate firm, needs, to register. under GST , even if the aggregate turnover, is less than Rs 20 lakhs, since Advocate Services is categorized under Reverse Charge. While a simple window of “Composite Levy” is available for Manufacturing/ Trading Sectors, the same is not available to Housing Society Sector. 2. Exemption: Payment of Municipal Tax may be considered as Payment on behalf of Member as an Agent, and maybe treated as outside the purview of GST and hence not taxable. Water charges, may be treated as Supply of Goods, and hence attracts GST at “zero %” as per the GST Rate table. Members in a GST Registered Society are exempted and will not be charged GST, if the maintenance charges on “Charges”/ Contributions” are less than Rs 5000 per month. Here, only ‘Charges for “Sourcing’ of goods or services from third party, for the common use” are to be considered. Thus, while ‘water charges, electricity charges, service charges, repair fund / maintenance charges, insurance premium, etc, are included while calculating the amount of Rs 5000/-, vehicle parking charges, non _occupancy charges, share transfer premium, hall booking charges and similar other charges are not included. The challenge for a housing society is to identify the members for application of GST and also identification of billing heads for considering the limit of Rs 5000/-. Also it is not clear whether for a member who is not in the exemption category, GST is to be charged on the amount exceeding this limit or for the entire amount. Going by Service Tax provisions, from which the exemption criteria is picked, GST is to be applied on the entire amount and not on the amount exceeding Rs 5000/-. 3. Invoicing : GST provisions require that Taxable and Exempt amounts must not be included in the same invoice. For Taxable amounts, tax invoice has to be issued, and for exempt amounts, bill of supply has to be issued. 4. Arrears : Even if a member has not made the payment, the GST charged to the member must be paid. Interest on arrears also attracts GST. Even this has to be paid once interest bill is raised on the member. Arrears problem itself is a challenge to Housing Societies. 5. Advances : GST has to be paid on the Advance Maintenance Charges Received; and adjusted against the invoice. when raised later. To distinguish the Advance against Taxable and Non taxable amount, and to calculate the GST on the same, keep a track of the same month after month is again a challenge. 6. Reverse Charge: On certain services, in particular for Services by an Advocate, GST will not be charged by the Supplier, But the GST has to be calculated and paid to the Govt. by the Society. Similarly, if the Society is procuring Services from any Unregistered Vendor, [ which is very common for Housing Societies], GST has to be calculated and paid by the Society. The GST rate may change from Vendor to Vendor depending on the kind of Supply [ service or Goods] , and its category. Again , since the invoice does not reveal the GST rate, it is again a challenge to know the GST rate for each category and pay. Input Tax on Capital Goods [Fixed Assets] is adjustable over a period of five years. To keep a track of this is a challenge. 8.Accounting: Most of the Accountants book expenditure directly without creating any vendor. Under GST, every Invoice has to be booked first, and then payment made against this invoice is required to be accounted: The Voucher posting work of the Accountant increases almost three fold. 9 Rectification of the Accounting Entries: Since all the rectifications in accounting entries.made are ‘required to be reported in subsequent Reports, of GST, one has to keep a track of the rectifications done. 10. 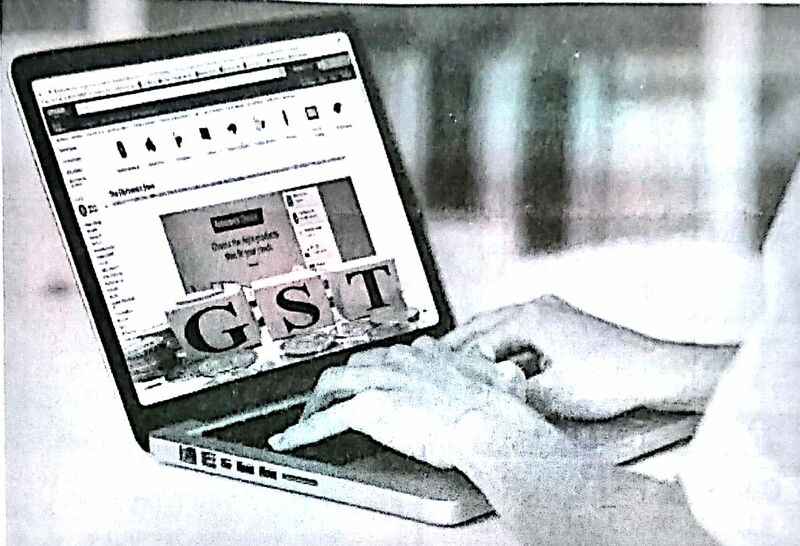 GSTN : All GST related issues [Reports and Payments] are handled through an online application GSTN. For making payments, one has to download a challan and make the payment online or through any authroised Bank. Many Societies do not even have Computers and transactions online itself becomes a Challenge. 11 Reports : This becomes the most challenging part. Most of the Societies do not have any full time Accountant. But the requirement of Reports is very much time bound. GSTR -1 is required to he filed on or before 10th of each month. GSTR-2 is required to be filed on or before 15th of each month, Between 15th and 17th of each month, one has to tally the GSTR- 1 of the input Supplier with our GSTR-2 , and ensure that the two match each other By 20th one has to pay the Tax, and Submit the Tax return in GSTR- 3. In addition, there will be GSTR- 9 , an Annual Return and GSTR – 9B [ GSTR Audit Report, if the aggregate turnover, exceeds Rs 1 Cr ] to be filed on .or before 31st of December. This will reconcile the GST-payments vis-a-vis the audited statement of accounts, of the Society. The compliance requirement of GST is very high. For very big societies, the cost increase is shared by a larger number of members. But for smaller societies, the cost increase becomes a very high burden on,the members. But this should not be a reason for not complying with the GST requirements. Since the invoices raised by Registered Suppliers on Unregistered persons are all uploaded in the GSTN, the chances of getting detected, if not Registered, is very high. While interest and penalty will be charged on the detected evaded tax, input Tax credit, including the One on Reverse Tax basis, which May be a very huge, will not be available. Meaning of RCM under GST: As per 2 (98) “Reverse charge” means the liability to pay tax by the recipient of supply of goods or services or both instead of the supplier of such goods or services or both under sub-section (3) or sub-section (4) of section 9, or under sub-section (3) or sub-section (4) of section 5 of the Integrated Goods and Services Tax Act, 2017. Applicability and Registration for Taxpayers who Pay Reverse Charge : All persons who are required to pay tax under reverse charge have to register for GST irrespective of the threshold Threshold:- turnover in a financial year exceeds Rs 20lakhs (Rs 10 lakhs for North eastern states). Invoicing rules: Every service recipient, who is paying tax on the basis of reverse charge, has to mention fact in his GST invoice that is being issued. A registered person who is liable to pay tax under reverse charge ,respect of goods or services received by him from the supplier who is not registered. (a) The service recipient can avail Input Tax credit on the Tax amount that fs paid under reverse charge on goods and services. (b) The condition is that the goods and services are used or will be used for business. (c) ITC in RCM cannot be used to pay output tax, it means payment mode only in cash. Composition Scheme under GST : Taxpayers with the aggregate turnover of Rs. 75 lakhs ( for special category states turnover upto Rs.50 Lakhs) in a financial year are eligible to pay tax under composition scheme. But, taxpayers paying tax on the basis of reverse charge under GST are not eligible for composition scheme. GST Compensation Cess : GST Compensation Cess will also be applicable on reverse charge. GST Compensation Cess will be levied and collected at a rate which will be notified later. This will apply , in on all supplies of goods and services, including imports and reverse charge supplies. Now that if you have to take registration, next question is what is the rate of tax? Under the heading 9995 — Services of Membership Organization, it is 18%, approximately 2.5% more than what you were earlier required to pay under Service Tax. But there is good news as well. Your society buys several products and utilises several services in course of ensuring welfare of its members. In that process, it used to pay different types of Sales Taxes and Excise etc., though only some of the Sales Taxes were visible on the bill. Now, your society shall pay GST to suppliers of goods as well as services and only the balance amount to Government. This will reduce over all tax liability for many societies, especially the bigger ones. But wait, what happened to that other section for registration, section 24? To understand it, we first have to follow something called ‘Reverse Charge Mechanism’ – RCM. Now when Society collects Maintenance Charges from the Members, it collects GST on it and pays to Government. When it buys Goods or Service from Registered Dealer, it pays the GST to supplier. BUT, when it buys them from Unregistered Dealer, under RCM, it will have to pay the GST on those goods/services out of its own pocket to government and can, of course, claim credit of it. Thus, this is not necessarily a big burden on society. The sting is in the second part of RCM. There are certain Services, for which, it is the responsibility of buyer to apply RCM, collect GST and pay it to the government, e.g. Legal Services for Business Entity. Now, section 24 says that you have to take registration if RCM is applicable to you and the turnover limit is not required to be fulfilled! Thus, even a small society with lower turnover, availing these services, shall he required to register. There is an important reprieve, maintenance charges are less than Rs. 5,000 per member per month, then the GST rate applicable is 0%. In short, you have to take registration but not charge the GST. But whether GST liability is there or not, Now once registered, the clumsy and time-consuming Statement updating is mandatory. Thus, every registered society shall be required to upload three statements a month and one annual statement. There is one more serious issue, which is a problem for Housing Societies. U/s 12 of the Act, GST would be charged on the date of issue: of invoice by the supplier or the last date on which he is required. Thus, even where the member defaults on payment of the charges, liability to pay GST would arise immediately in the next month. This will be financially burdensome for co-operative housing societies, which have working capital troubles. This may even increase the friction in the society, since timely collection of dues would become a crucial matter. RCM, Time of Supply and cumbersome return filing are grave issues and they are hitting every single organization, especially of smaller size, in a big way. It is expected that the Government, in its infinite wisdom, shall soon take cognizance of it and rectify some of the anomalous provisions. Meanwhile, it is important for all those covered under this Act, to register themselves as soon as possible for GST. Ultimately, this is a new regime, introduced somewhat hurriedly and unprepared, by the government, intent to go for an important Tax Reform. The baby is delivered under C-Section surgery and we all shall have to bear the pains of its birth for a while to come. Over a period, this New Baby of Emerging India shall find its feet and strengthen us all, is definitely a Hope…! CA Ajit Joshi, Author, is a practicing Chartered Accountant, also teaching at PTVA’s IM as Assistant Professor. He can he reached at meeajit@gmail.com or 9869424479.